Successful mobile mapping strategies and uses for mobile maps. Map It! offers location information via Google Maps® with the touch of a button. MapIt! 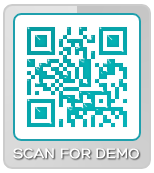 can be triggered from a 2D barcode or from a link in a mobile landing page. Both options are direct to content. MapIt! is a trackable call-to-action. Full analytics are available. Scan the code to locate PRINT2D's Santa Monica studio.